The modern understanding of what constitutes disruptive innovation is an extensively evolved version from its original conception in 1997. Traditionally, the term has primarily focused on technological innovation that would surpass the seemingly superior technology in the market. Overtime, the application has widened to include not only technological innovation, but also business-model innovation. It is crucial to distinguish the specific types of disruptive innovation. Since each type poses a unique challenge, and so are the responses by the incumbents. Business-Model Innovation is the discovery of a fundamentally different business model in an existing business. For example, Amazon and Barnes & Nobel compete in the book retail business in fundamentally different ways. Similarly, Charles Schwab and Dell compete substantially different from Merrill Lynch and HP (or IBM). It is important to note that the existing businesses typically respond to this disruption, but the response does not necessarily mean that they have to adopt it. Alternatively, the existing firms can invest in their current operations to make it more competitive relative to the disruptors. Technological innovation tends to be disruptive for the established competitors by creating ‘new-to-the-world’ products (e.g., the automobile, television, personal computers, VCRs, mobile/smart phones). These innovations change both, the consumer’s and producer’s existing habits and behaviors significantly, because the market they (innovations) create undermines the capabilities and competitive advantage of the existing competitors. Embracing the change in business model is a challenging decision that requires a consistent leadership support. Since such a change often involves actors beyond the boundaries of the firm. Attempts at business model renewal therefore take place under conditions of interdependence. Clearly, this issue imposes constraints upon efforts to change the business model, as firms cannot maintain a complete control over their network. The firms, both incumbent and entrant face the challenge of embracing the disruptive change in their business model. The entrants, however has typically overcome this issue before going to market with their technology/innovation. So the main challenge lies with the incumbents to either accept this challenge or face the fact of elimination. In a disruptive innovation model, the innovation (product or service) starts out as a loser in the market. It overtakes what the industry experts call “sustaining innovations” which are subsumed by the attractiveness of the disruptive alternative after some adoption time. The challenges both incumbents and new entrants have to face, are to keep their technology/innovation as distinct as possible over time. The key is to keep the path for pace of technological progress and disruptive innovation parallel to each other. If not, then the sustainability of both parties is jeopardized. 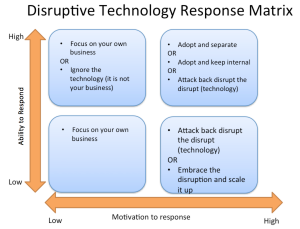 Disruptive technology response matrix below depicts that every organization needs to determine its own specific response according to the unique circumstances facing it. The recommendations here are applicable only at an average, but appreciating that the new ways of competing are not inherently superior to the existing ways and that established companies have many options for responding is half the battle. The challenge for both respondents and new entrants are to keep the response motivation levels high. The firm should layout the roadmap to ensure that their technology/innovation can be sustained over time. The concept of asymmetric motivation explains that incumbents that have already committed substantial resources to profitable established markets are normally less motivated to cannibalize the flow of income when confronted with disruptive innovation. Due to this conflicting business models, integrating disruptive innovation in an existing organizational structure may negatively affect established value propositions including prices, product qualities and company image. Capabilities misfit is the root of the tension in disruptive innovation as the conflict between the business model already established for the existing technology, and that may be required to exploit the emerging, disruptive technology. A firm’s capabilities can be defined by the company’s ability to identify, integrate, develop, and to configure its own and others’ competences and resources to innovate. These capabilities can enable radical change when prior competences can be leveraged or obstruct change when conditions amplify capabilities misfit. The Cambridge Global Advisory team analyzed and presented findings on some of the above-mentioned innovative products and the respective consumer reactions towards these disruptive technologies to both mature and start-up organizations. The CGA team guides our client leadership towards making these key decisions, backed by current market trends and technologies that have been causing changes in consumer behaviors. About the Author: Waqqas Mahmood is the Member of the Advisory Board at Cambridge Global Advisory (www.cambridgeglobaladvisory.com). Have a question or comment? Email the author at, waqqas.mahmood@cambridgeglobaladvisory.com.